By Kristin Masters. Aug 14, 2018. 9:00 AM. V.S. Naipaul once said that no woman writer could be his equal. He did not win any points with feminists and those striving for gender equality, but it's hard to argue with his literary output. Again, we have to ask ourselves, how do we separate an author's ideology from the work he or she produces? Do we? Can we? Should we? Born August 17, 1932, Nobel laureate V.S. Naipaul died on Saturday, August 11, 2018 at the age of 85. The author is considered one of the modern legends of literature. 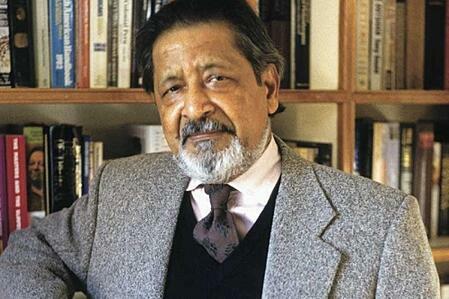 Sir Vidiadhar Surajprasad Naipaul was born in Chaguanas, Trinidad and Tobago. His parents were indentured servants, shipped to Chaguanas from India. Naipaul's childhood of deprivation heavily influenced his ideology and writing. A scholarship to Oxford took him to England, where he eventually wrote his first novel. The Mystic Masseur (1957) draws heavily on Naipaul's youth in Trinidad. It was also adapted for an eponymous film in 2001. J.M. Coetzee described Naipaul as a "master of modern English prose" in 2001, and in 2008 Naipaul was ranked seventh on The Times' list of 50 greatest authors since 1945. In May of this year, Naipaul's In a Free State was one of five books shortlisted for the one-time Golden Man Booker Award. According to Baroness Helena Kennedy, the chair of the Booker Prize Foundation, the shortlist "showcases what the Man Booker Prize is all about: fiction of the highest quality". A public vote took place following the announcement of these five titles, and in early July "The English Patient" by Michael Ondaatje won the Golden Man Booker Award. Naipaul has always insisted that he has no political view, and that his works transcend any specific ideology. His critics often find fault with this outlook. Naipaul once called Tony Blair a "pirate" and described Islam as "the most uncompromising kind of imperialism." Naipaul again caused shock waves in May 2011 during an interview with the Royal Geographic Society. He noted that writing by women was inferior to that done by men due to its "sentimentality" and "narrow view of the world." The Nobel laureate is also often criticized for his unsympathetic view of the Third World, which is frequently reflected in Naipaul's travel writing. This outlook is most obvious in An Area of Darkness and The Middle Passage. Though Naipaul's views are polarizing, few deny his incredible talent as an author and philosopher. Certainly he will continue to be read and discussed. Master Content Brain. You think it, she writes it, no good thought remains unposted. Sprinkles pixie dust on Google+, newsletters, blog, facebook, twitter and just about everything else.